For use in new-build projects where low screed height qualities are a primary concern. Polystyrene panel is easily cut to length with a utility knife, making for rapid construction. Includes 20mm integrated insulation as part of overall height build-up. For use in new-build projects where achieving a level screed with minimal labour is an important factor. Polystyrene panel features foil coating to prevent absorption of the self-levelling screed, and is easily cut to length with a utility knife for rapid construction. Includes 20mm insulation as part of overall height build-up. 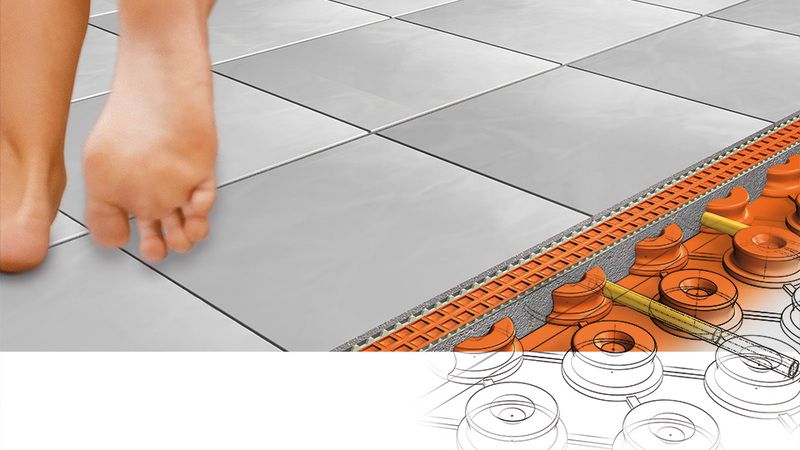 Crossover system suitable for use in new-build and select renovation projects, in combination with either dry or flowing screed. Installed in partnership with an insulation layer of own choosing. Sound reduction properties make this system ideal for first and second floor use, as well as over sub-floor constructions of timber. Sound reduction capabilities of up to 25dB. For use in small-scale renovation projects and extensions, as well as new-build projects where a particularly low height build-up is required. EN 12 FK - Studded screed panel, needs to be adhered with a cement based tile adhesive.